Download "Outlook Web App User Manual 1. Outlook Web App 2013 User Guide"
5 Outlook Web App User Manual 5 The reading pane displays the conversation that you ve selected. E Instant Search Box Type what you want to search for here. This could be a sender or recipient s name, or a word or phrase in the title or body of a message. Below the search box are filters that you can select to quickly find messages that are unread, that include your name in the To or the Cc line (to me), or that have been flagged. In addition to the filters, you ll see the name of the folder you re viewing and the view you ve selected. For more information on selecting message recipients, please see the section titled Selecting recipients for your . F Action Bar You can respond to any message in the conversation by using the REPLY, REPLY ALL, or FORWARD links above the message. You can access more actions using the menu, for example to categorize the message or mark it as junk. G Main Toolbar The main toolbar contains shortcuts to Outlook ( ), Calendar and People (contacts). You can also use this toolbar to access your settings, user profile or sign out of OWA. 6 Outlook Web App User Manual 6 3. Using the Outlook Web App Creating a new message To create a new message: 1. Click in the top left corner. A new message form is displayed in the reading pane (or in a pop-up window, if you have disabled the reading pane). 2. Enter the recipients in the To or Cc field. You can type the name of anyone who is in your contacts folder or establishment s address list, or you can type the address. The first time you enter a particular person s name, Outlook Web App searches for that person s address. In the future, the name will be cached so it will resolve quickly. 3. Enter a Subject for your message. 4. Type the message you want to send. 5. To add an attachment, click INSERT then Attachment at the top of the screen and browse to the file you want to attach. 6. To embed a picture, so that it is displayed in the message without the recipient having to open it, click INSERT, then Picture, and browse to the picture you want to add. 7 Outlook Web App User Manual 7 7. When you ve finished and your message is ready to go, click SEND. Other messaging options For a menu of other options, click the extended menu icon. Here you can choose from the following options: Save: Outlook Web App automatically saves your messages as you compose, but you can choose this option to force a save at any time. Show bcc: You can use bcc (blind carbon copy) to add a recipient while hiding their name from the other recipients. Show from: If you have permission to send from more than one address, you can use this field to change the from address of the message you re composing. Set importance: Use this to set message importance. This doesn t change how Outlook handles the message, but lets the recipients know whether the message is of high or low importance. Insert signature: If you ve created a signature in Mail settings, but didn t configure it to be automatically added to your messages, you can add it by clicking here Switch to plain text/switch to HTML: HTML text can be formatted with bolding, underlining, colored text, a choice of fonts, etc. 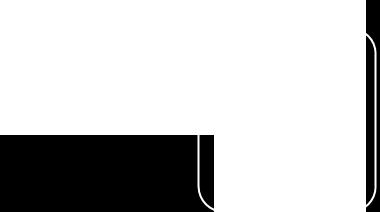 If HTML text is selected, a text-editing toolbar is displayed above the message body. Please note that your recipient(s) may be using a device that can t display that formatting correctly. To customize the selection of tools shown on the toolbar, click the down-arrow at the right of the toolbar, and check or uncheck the boxes to choose the tools you want to be displayed. 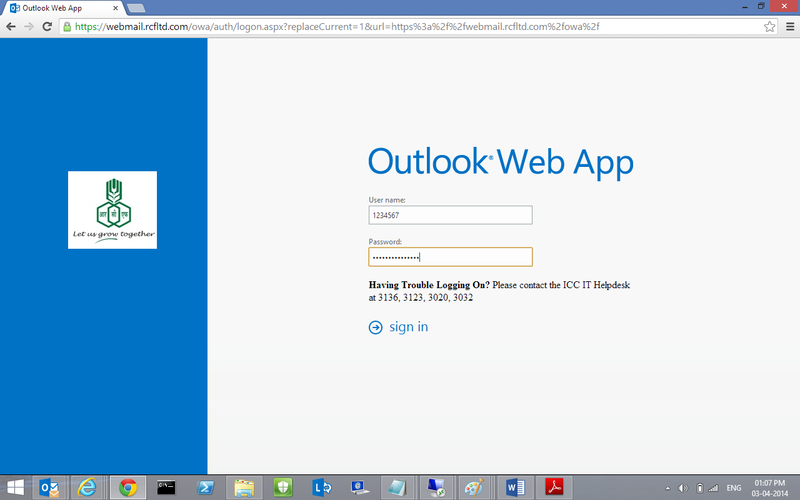 9 Outlook Web App User Manual 9 or Cc Link at the left of the lines, or the + sign at the end of the selected field. Clicking on any of these links opens the Address Book, where you can search for a person in the Global Address List (GAL) or your Contacts folder. You can use the double arrow (<<) at the top of your contacts folders to collapse or expand them. Once you have located your recipient, select their name(s) and click Add to add them to your message. When you have finished selecting your recipients, click OK to confirm and return to the message (or CANCEL to remove). To remove recipients from a message, right-click the name and then choose remove, or select the name and press the Delete key. Using the Blind Carbon Copy Feature (Bcc) You might want to include recipients without having them visible to everyone you sent the message to. You can do this using Bcc (Blind carbon copy). Bcc recipients get a copy of the message, but their names don't appear in the list of recipients. 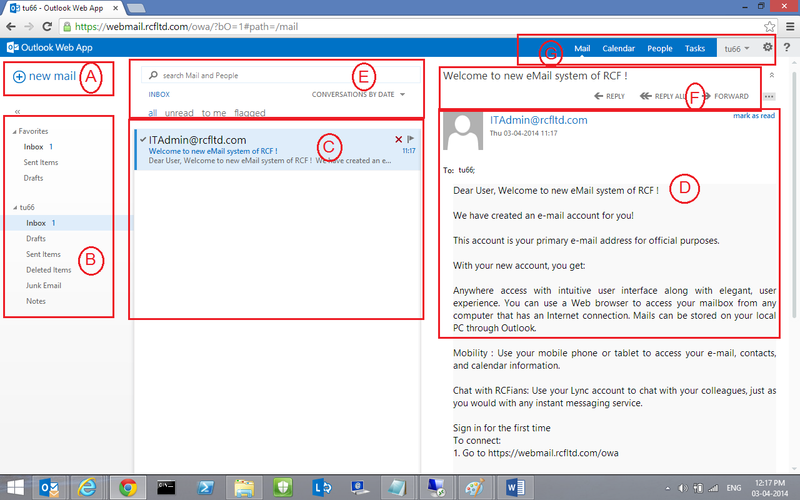 10 Outlook Web App User Manual 10 To access Bcc, click the extended menu icon will appear on your new message. within a new message and choose Show Bcc. A Bcc field 5. Reading and replying to your mail To check your Your mail arrives automatically into your inbox. There is no need to manually refresh the browser screen in order to load new s. To read a message: Click on a message in the list to display it in the reading pane. Alternatively, you can double-click on an from the list pane to open the message in a new window. To reply to or forward a message: 1. In the reading pane or message window, click the response option you want (REPLY, REPLY ALL or FORWARD) 2. Add any additional recipients, if required (for more information about selecting your recipients, see section titled Selecting recipients for your Enter the content of your message. 4. When you have finished, click SEND. 11 Outlook Web App User Manual Creating and using mailbox folders It s useful to create folders in your mail area, to help you organize and find your messages. The left-hand pane displays all the folders you have access to. When you select a folder, items from that folder are displayed in the center message list. Creating new folders 1. Right-click Inbox, as this is the folder that will contain the new folder. (To create a new top-level folder, you would right-click your name at the top of the list.) 2. Choose create new folder. 3. In the blank field, type the name of the new folder. 4. Press Enter to save your changes. 14 Outlook Web App User Manual 14 - To select a block of adjacent messages, select the first message and then hold down the Shift key while you click on the last message in the block. - To select multiple messages that aren t adjacent, hold down the Ctrl key while you click each message you want to select. - To search your s, use the search mail and people box at the top of the center pane: type in the word, name or phrase that you want to find. - When you are using the search box, various options for refining your search are displayed in the left pane, above the folder list. - To clear the filter/sort/search fields, click the grey X to the right of the search box. Printing s To print an , click the extended menu icon within the message and choose Print. Deleting s s can be deleted several ways: Deleting messages from the message list: Option 1: Select an from the message list and press the Delete button on your keyboard. Option 2: Right-click on an in your message list and choose Delete from the menu options. 15 Outlook Web App User Manual 15 Tip: To delete several s at once, hold down the Ctrl button of your keyboard (on Windows computers) as you select multiple s from the message list. Deleting messages from the reading pane: Option 1: Click the extended menu icon and choose Delete. 16 Outlook Web App User Manual Understanding and Using Conversation Threads Conversation view shows all messages with the same subject as a threaded conversation, no matter what folder they're stored in. For example, if you've replied to a message in your Inbox, you'll see both the original message and your reply in conversation view. The default setting for the list view is to group messages by conversation and to sort them by the date received, with the newest messages on top. You can change this option by clicking the sort arrow at the top of the list view and choosing the off option for conversations. When you turn off conversations, messages are displayed in the reading pane individually. If you want to review a conversation from the main window, click the arrow by the subject line to expand or collapse the conversation. The image below shows an example of an expanded conversation in the conversation view. When the conversation thread is expanded, the messages in the thread are listed under the subject line; you can click any message to review it in the reading pane. In the reading pane you can click on the message to expand or collapse it. 17 Outlook Web App User Manual Using Contacts (People) The People area is where you can access your stored personal contacts and view any distribution or address lists that have been created, such as the Global Address List (GAL). You can use a contact card to store as much or as little information as you like about a contact. You can also create groups within your People folders. Groups can be used to send to multiple recipients through a single entry. To access the People (contacts) section, click on the People link located on the main toolbar. The image below displays the People area of the new OWA interface A New contact button Click to create a new contact. B Sources: Select the source(s) you want to include for contact information. Under My Contacts you can create folders for your contacts. C Contact list Shows a list of all contacts in the current folder/search. 18 Outlook Web App User Manual 18 D Contact details Shows contact information for the selected contact E Search box Type here to search for contacts in your Directory. Below the search box are filters you can choose to restrict the items displayed (people, groups, rooms or all). Linking and unlinking contacts Outlook Web App detects contacts that have the same or very similar display names, and will link them into a single view. 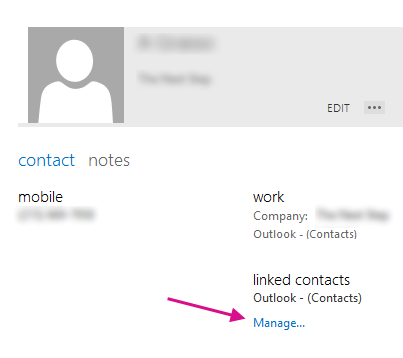 To see which contacts have been linked, choose a contact card, and then click Manage in the reading pane. Creating and using contact groups You can use contact groups to send to multiple recipients through a single entry in your Contacts folder. A group can include entries from your Contacts folder and from the Jefferson Global Address List (GAL). You can use groups to send messages and meeting requests just as if they were individual contacts. Groups that you create in your contacts folder do not appear in the Global Address Book. To create a contact group: 1. Select the contact folder where you want to create the group (My Contacts or a subfolder). 2. Click and choose create group. 19 Outlook Web App User Manual In the new group window, enter the information you want to include for the group. Group name: Enter a display name for this group. Members: Use the search box to select the names of the members you want in this group. Notes: Enter any other information you want to include about this group. 4. Click SAVE to create the group. The new contact group is displayed in your contact list, and can be quickly located using the group filter. 20 Outlook Web App User Manual The Calendar Area Your calendar lets you create and track appointments and meetings. You can create multiple calendars, link to other people s calendars, and even share your calendar with other people within Jefferson. A meeting that you ve been invited to will show the organizer and include links to respond to the invitation. If the organizer has included an online meeting invitation, you ll see a link to join the meeting. You can display your calendar in four different views: day, work week, week, and month. The image below displays the Calendar area of the new OWA interface A New Event Button Click to create a new appointment, meeting or all-day event. B Outline calendar Use section to navigate to the date you want. Shading indicates the week/month you re currently viewing, with the current date shaded darker. Use the right and left arrows to move to the next or previous month. Click <</>> navigate between months. Click on the month name to quickly navigate to a specific month/year. 21 Outlook Web App User Manual 21 C Calendar selection You can view more than one calendar at a time. This section lets you create other calendars, e.g. for a specific project or for personal appointments. You can also add other people s calendars and select which to display. If you select multiple calendars to display, they ll be merged into a single view with each calendar coded by color. D Main calendar area Here your calendar items are displayed, and you can also create new ones. Double-click any white space in this window to create a new item for that time, or click and drag to create a new item in a longer time period. E Calendar entry detail When you select on a specific calendar entry from the main calendar area, the entry s details will appear in this pane. If you are in month view, you will see your calendar entries for the day you have selected in the main calendar area. F Selected calendars This area will list the calendars that are currently being viewed in the main calendar area. If you have selected multiple calendars to view at once, then each calendar will be listed in this area with its associated entry color. To eliminate a specific calendar from view, click the x next to the calendar name. G Additional links This area provides more navigation shortcuts. Click the link to view the selected period. Use the right and left arrows to move to the next or previous period. H Day, work week, week, month Select the calendar view you want, and share or print your calendar. 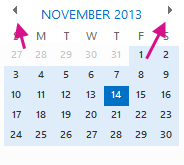 Week view: This is the default view when you first visit your calendar in Outlook Web App. You can use the links in the top right corner to change to day, work week or month. Day view: The day view is most useful if you have many appointments in a day, or if you want to view multiple schedules side by side. The controls remain the same; only the view has changed. Month view: The month view can appear crowded. To make it more usable, an agenda is displayed for any day you select. 22 Outlook Web App User Manual 22 A Month view Dark shading shows the current date; lighter shading shows the selected month. B Current day The selected day is shaded with a blue bar. To view an item, double-click it. To create a new event on any date, doubleclick in the white space for that date. C Selected date Selected date(s) will be shaded in light blue. D Agenda The agenda for the selected day. To create a new item for the selected date, double-click in the white space in the agenda. Number Title Description Contains shortcuts to folders and locations. Click on More to display your entire list of folders.